Bio - Bill Doherty Jr. The Story Behind Bill Doherty Jr. I was born and raised in Dedham, MA. Just outside of Boston. I have always been an artist. My imagination transfers into everything I do. All through school I was the kid always going on grand adventures that I found in the "jungle" up the street or "caves and tunnels" in and around my house. ​In my teens I transferred a lot of my imagination onto paper. I would draw anything and everything I could. My attention was always feeding into the artistic and creative aspect of my life. My school work reflected this. In any subject where any sort of creativity and imagination were applied, I excelled in (i.e. chemistry, electronics, art, english, and even one logical subject which in itself is an art - math). I eventually went to a vocational school where I took on Advertising Art. I expanded my medium from paper and pencil, charcoal, pastel, etc. to photo and computer. After my High School experience I decided to follow the Grateful Dead. I am a huge fan of them and the lifestyle of the "Deadheads". I went to as many shows as I could, even if I didn't get in. Sometimes I would rather hang out in the lot at the drum circles than go into the show. The drum circles were mesmerizing to me. It wasn't until a couple of months into my travels that I got up enough guts to ask someone if I could play their drum. I was so nervous. But, I sat on that drum in the fields of the original site of Woodstock, at their annual Woodstock celebration, and hit my first beat. I fell in love. It was a whole new medium to express myself. 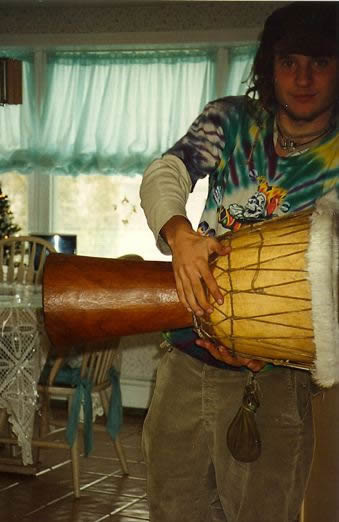 Playing tribal drums was a spiritual awakening, not only for me but for the people playing alongside me, and for the people dancing around the fires we built. The more I played the more spiritual it felt. They say in a drum circle the drummers are the mediums bringing the spirits out and the dancers are the horses that carry them. Maybe that's why I found the drums so alluring. To me, to this day I can't explain to you how I play, or teach someone else to play anything beside a basic beat. I just do it. It just comes out, from another unknown place I can't explain, that is shared with anyone who is around. That to me is amazing. To be able to share something so profound with others and have them experience something on the same level but in a different way, catered to their own individuality. I travelled for five years around the country. The majority of my traveling was done hitchhiking, most of the time solo. It seemed when I traveled solo the path I went down was more adventurous. Strange and wonderful things seemed to happen more often than not when I was alone, than with someone else. Don't get me wrong. The company was always good. But the adventure is where my heart is. The self discovery. And if the solo journey was more fruitful. Then that was the path I needed to be on. I found myself living for months at a time in different national forests with other hippies at rainbow gatherings, hitchhiking across country just to see the scenery, hopping a freight train out of Tucson, Arizona to California only to get kicked off in Yuma, AZ by yard dogs. In my experience, riding a freight train through Arizona was by far the most beautiful ride I have yet to be on. If I had the opportunity I would do it again in a heartbeat. ​When I came back to Boston I had to hang up my drum, only to let it out on special occasions. There was no room for it. Not the way I play. The police made that very clear to me. Multiple times. A few years passed and all the time I was here I still searched for the artistic side of anything I did, and believe me, some of the things I did I had to search really really hard. At one point I started drawing again. Only my canvas was skin. It was a great experience but there was still something missing. I felt caged. I needed to find something to free myself, and I did. It was right there in front of me. I pulled together my courage once again. I went out to seek information about acting. I found it. I opened a door to my soul that was on a whole new extraordinary level of artistic expression, a whole new level of spiritual awakening, a new adventure of self discovery. It is the ultimate adventure. The ultimate drum. I am experiencing something that completely blows my mind and body on a daily basis. To be courageous enough to expose pieces of my soul to anyone around that I wouldn't normally allow myself to be vulnerable in front of is a gift and to have the audience experience something in themselves whether it be love, hate, laughter, tears, is a gift not only to me, but to the audience experiencing the performance. Which makes the reward that much better. Being able to own and expose all of the archetypes that are in me, that are in everyone, still amazes me to this day, and I'm sure it always will. It is a gift that I am forever grateful to have. This is my calling. The path of my heart that I have followed faithfully my whole life has lead me to this realization. That I am an actor, a storyteller.